The perfect Aska vacation getaway! Experience modern mountain living at Grand View! 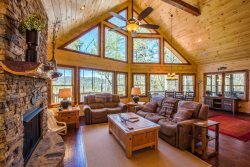 This luxury mountain view rental cabin offers accommodations the way it was meant to be. Once you get here, you will not want to leave! Upscale 3 Bedroom, 3 Bath cabin on 3 separate levels provides great privacy for everyone. Living Room w/ rock fireplace on the main level as well as an additional finished basement including another large den or movie room with a pool table. Dart board, game bar top table, wet bar, and rock fireplace w/ gas logs. Enjoy the great outdoors with all of the special outdoor living spaces including an 2 level screened in porch with a 2 level rock wood burning fireplace so you can enjoy the relaxation & warmth of those crackling fires from both the hot tub and dining room area. Large screened in porch spans the length of the main level of cabin with wrap around decks. The over-sized rock fireplace, soaring cathedral ceilings, & fixed glass adds to the warmth of the main level great room that is open to the kitchen & dining room areas. Master Suite features a bathroom with a large tiled shower and the bedroom features French doors leading to private balcony where you can watch the sunrise over the mountains. Layered panoramic mountain views can be seen from virtually every room of this home!!! Located in the Aska Adventure Area approximately 15 - 20 minutes to downtown Blue Ridge. 5 minutes from Canoe rentals by Jon Ron Toccoa River Outfitters (866) 857-8758. Very Private in beautiful wooded setting with a great mountain view. Basement features rock gas log fireplace, TV with DVD player. TV's available in, living room and basement. A DVD player is available in the basement. Your team was knowledgeable and friendly. Easy to work with. Wish the beds were softer along with the sofas on the main floor. But it felt like someone actually lived there and thought about what makes the cabin a home which was nice. Kind of like visiting a friend or family member. Very attentive - I called regarding firewood and was promptly told they would order the wood for me and have it delivered prior to my arrival - wood was on the front porch! Thank you for dealing with a difficult situation so promptly and professionally. They were all great, very helpful. Beautiful cabin, great views, very peaceful & secluded. The staff are friendly and gave great suggestions for things my family would enjoyed. Property was everything and more I expected. Would love to stay in the cabin again, my family really enjoyed the property and its amenities. Loved It! Our car could not make it up the gravel road, so you all assisted us by contacting near by residents so we could park or car safely. CABIN WAS GREAT PLENTY OF SPACE AMENITIES JUST LIKE IT WAS ADVERTISED. WE ARE RETURNING IN OCTOBER FOR A WEEK'S STAY. REALLY LOOKING FORWARD TO IT! This was my 3rd rental with you. It won't be my last !! Parking should not exceed 3 medium size vehicles, turning around can be difficult with 2 or more cars. Gravel incline to cabin not recommended for low profile vehicles.